Mention ‘Bluetooth marketing’ and those who are old enough will no doubt be reminded of the horrible ‘pairing requests’ that plagued anyone with a Bluetooth phone in the early 2000s. But now, according to Alex Sbardella, head of retail at Red Ant, it is back with a vengeance in a new, improved and much more useful format. Sbardella explained that iBeacons are essentially ‘GPS for indoors’, allowing for personalised, micro-location based notifications and alerts. “They’re the Apple-branded version of an existing technology – Bluetooth low energy (BLE) beacons – which has been around for about 18 months and is already supported by the majority of recent Android handsets,” he said. The digital retail expert shared his thoughts on the potential for iBeacons to be disruptive. But, with iBeacons, it is possible to create beacons, which can support both iOS and Android/Windows devices at the same time. “This means retailers know that, however they choose to implement beacons, they can serve the majority of their customers without complications,” he said. He also said the total cost of ownership for beacons is far below the usual level for enterprise retail hardware, to the point where they can almost be considered disposable. 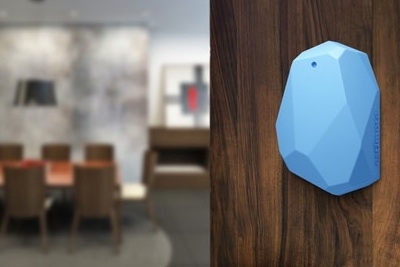 “The ‘low energy’ part of BLE is important – beacon manufacturers Estimote [pictured], for example, claims its devices can run for two years on a single coin battery, greatly reducing the maintenance overhead for retail operations teams,” Sbardella continued. Accurately locating customers indoors is a problem hardware manufacturers have been struggling with for years. Sbardella highlighted how this means that the ‘local’ experience stops when it's most important – once the customer is actually inside the store. “By creating a mesh of beacons and using triangulation, shopping centres, large stores or even public spaces like museums and stadiums can start providing visitors with really useful information based on their immediate environment – with an accuracy of inches rather than feet,” he added. “Much of the functionality enabled by beacons could, in theory, have previously been achieved with NFC [near-field communications] or even QR [quick response] codes,” Sbardella continued. “The crucial difference with beacons is that to use them requires almost no effort on the user's part – the information can just appear before them. Retailers can also catch brand fans (provided they’re looking at their smartphone) with exclusive offers while they are outside the store, perhaps tempting them in when they would have otherwise walked straight past. The digital retail expert also pointed out how passive detection means beacons can enable store staff to easily identify specific customers and quickly link them with their digital activity, bringing a whole host of customer service benefits and a real opportunity for ‘surprise and delight’. “Imagine silently detecting and verifying a click & collect customer as soon as they enter the store, and having their items ready for them before they even reach the service counter,” he suggested.